Love to write stories? Join the free course! Success! Now check your email: the download link will arrive very soon. If you buy something through a link on this site, and you would like to get some tips on setting it up, or are just curious about best practices, feel free to email me for advice. I offer this tech support because some of the links on this page may be "affiliate links." This means that I may make a commission -- from Amazon, iTunes, or another company -- if you buy something through that link. This doesn't change the price for you; it's a finder's fee paid to me by the supplier. I only recommend things that I use, love, and know how to help someone else understand. Sorry the tables in this post look so bad (Microsoft Live Writer and WordPress aren’t quite as compatible as I thought). Once I figure out how to fix them, I will. language while I have plenty of time during my cancer treatments! The summer plans turned out slightly different, but I will catch up later. Thanks for these posts! Great job, this is awesome information, and something I’ve been struggling with. Mind if I link this on my blog? Thank you, Harrison, glad you liked it. Link away. Only–I have the odd feeling you aren’t a real person. Are you? When it comes to saying something deep, words fail. And they are frail, too. You may wonder why I’ve suddenly started off accusing words when they , according to the Bible, existed in the beginning. I have my own reasons: I cannot appreciate you enough for your eagerness to selflessly share the keys to writing — which you have found the hard way — to us, to help us unlock the door to inner richness. You seem to be a lovely writer, not a ruthless one. May blessings be upon you. Should have written share it with us. Thank you, Ramesh. I try only to be ruthless with myself. It is hard going much of the time. I read this essay some time ago and have been practicing with it, and yes, it really does make a difference. 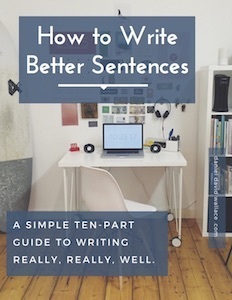 It also helps me better articulate my feedback to others in my writers’ group, about why a sentence (especially a key sentence ending or beginning a scene) is falling flat. Thank you so much for this insight! Have you heard of Dr. Brooks Landon Great Course (Teaching Company) Building Great Sentences? It’s great. I really like that course, and it was very helpful when I was researching these ideas. I thought I had credited Brooks Landon in my posts — if I hadn’t, that’s bad. I would recommend Building Great Sentences to every writer. Now, I feel like his series is great in its first half, but it seems runs out of steam in the second half, a little, after he covers the cumulative sentence. I think there are aspects of sentence-making beyond the topics he covers in that course: this little series tries to collect all the ones I knew about at the time.